Ranger waste containers feature Rubbermaid's famous durability, modern styling, and easy-to-service design. 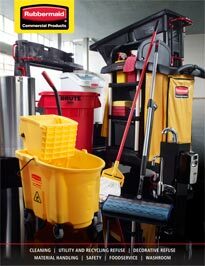 High-capacity waste management: 65 Gallon Ranger is the largest waste container in Rubbermaid's line. Designed for stadiums, parks, shopping malls, and other high-traffic areas. Pedestal base ring on 45 Gallon and 65 Gallon Containers for stability and security.